Home »Posts Tagged "Social Metrics"
What’s the next step after settling social presence for an online retail business? According to this report social commerce leaders have set the path to the direction of social shopping features integration as part of an e-commerce site’s funcitonality. A turnover in online search landscape? Facebook graph search is emerging determined to claim its share from the search pie and extend network’s advertising revenues. How will digital marketers cope with it? An extensive review with qualitative and quantitative social media metrics concluding the social media marketing effectiveness of the most popular fast food companies on facebook and twitter. Hungry for rankings? Here are useful formulas for social marketing metrics valid for all platforms, proving that social engagement is measurable and tangible. 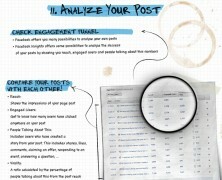 Utilize and analyze the results of your social efforts.